A new drug is the subject of a news article on the ‘Ninemsn’ page. The one that comes up when you log out of your hotmail account. A drug that takes your weight away. Why? Why would a website promote a drug that shames bodies? How is it a ‘dream come true’? Why would you pressure people into buying a product that is probably no good for them? How can ‘diet’ and ‘nutrition’ be in the same category? A bit of an oxymoron, don’t you think? Why can’t people accept themselves and others the way they are? In a world full of body hating, we don’t need a ‘dream drug’. We need a new mind set. Sorry, no link. I lost the page after taking the picture. 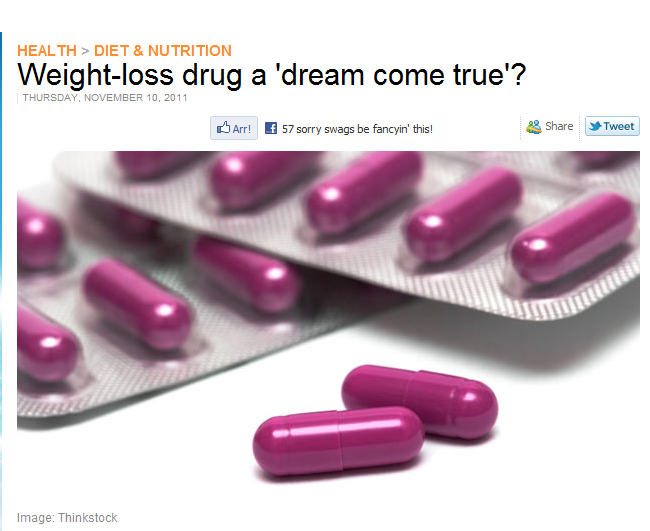 This entry was posted in Body hating, Sterotypes and tagged body hating, body shaming, dream, dream come true drug, dream drug, dream drug come true, drug, weight, weight loss drug. Bookmark the permalink.